Are financial crises an inevitable feature of capitalism? Must the government rescue the system when huge crises occur? In his book Stress Test, Timothy Geithner, president of the Federal Reserve Bank of New York and US Treasury secretary during the 2007-09 crisis, answers “yes” to both questions. Yet these answers also harm the legitimacy of a market economy. It is bad enough if capitalism is crisis-prone. It is worse still if the state feels obliged to rescue those whose folly or criminality caused the damage, to protect the innocent. Mr Geithner argues not only that crises are sure to recur but that governments must react with overwhelming force. The only way to stop a crisis is to remove the circumstances making it rational to panic. That means the government must borrow more, spend more and expose taxpayers to more short-term risk – “even if it seems to reward incompetence and venality, even if it fuels perceptions of an out-of-control, money-spewing, bailout-crazed big government”. This is a bald statement of an unpopular view. The view that capitalism is crisis-prone seems compelling. Stability destabilises. It is, Mr Geithner suggests, human to take on risk during a prolonged period of prosperity. That happened in the leverage cycle which preceded the crisis (see chart). People did not take on leverage because they expected to be bailed out. They did so because they expected to gain. Yet there also exists what I like to call “rational carelessness” – the fact that bailouts were likely if the worst came to the worst surely comforted creditors and so increased the risk of a destabilising credit bubble. Once Lehman Brothers failed, a new depression seemed to be on the way. In response finance ministers and central bankers of the Group of Seven leading high-income countries promised in October 2008 to “take decisive action and use all available tools to support systemically important financial institutions and prevent their failure”. They did, and it worked. Panic – as measured by the spread between rates on unsecured interbank lending and expectations of future official interest rates – diminished. In the US the economy started to stabilise after two quarters of contraction. Mr Geithner’s view is that the correct response to such a crisis has three elements: massive monetary and fiscal support; guarantees for the liabilities of systemically important institutions; and harsh stress tests. If an institution fails to raise capital, the government must inject it. The conditions of the time – above all, the limited legal authority of the US (and other) governments – made a more tailored approach almost impossible to adopt. The value of assets was so uncertain, capital buffers so tiny, the reliance on short-term borrowing from fickle sources so ubiquitous and the mechanisms for resolving complex financial institutions so inadequate that governments had no reasonable alternatives. They simply could not risk the economic results of a cascading financial collapse. Similarly, the authorities had to use monetary and fiscal instruments freely, to limit the longer-term economic damage. Even so, the costs have been huge. In the first quarter of 2014, US gross domestic product was as much as 17 per cent below its 1950-2007 trend (see chart). Capitalism is indeed crisis-prone and the US government was right to intervene during the crisis. These conclusions leave us in a desperate position, with our fates apparently attached to a doomsday machine. The response of many on the free market side seems to be that the government should not impose increased regulation of the financial system, but simply rule out a rescue next time. Such is the unpopularity of bailouts that this approach might even be tried. But the consequences are likely to be catastrophic. A more attractive possibility is to make the system far less unstable and far easier to deal with in a crisis. The options here include: higher capital requirements for any institution likely to prove systemically important together with requirements for long-term debt that can absorb losses in a crisis; reduction of tax incentives to take on debt; safer bank deposits backed by far higher reserve requirements; enhanced regulatory oversight of the system; and far greater ability to resolve complex financial institutions when they become insolvent. Such measures should bring the world closer to what Ms Bair desires. It is likely that mistakes were far more important than moral hazard in creating the crisis. Yet after the rescue moral hazard does indeed exist, above all among the creditors of the systemically important institutions. Mr Geithner has pushed for tighter regulation. But he also offers a law of unintended consequences. The safer the visible financial system is made, he argues, the greater the danger that the fragility will emerge somewhere less visible, but possibly even more dangerous. This, he adds, is precisely what happened before the crisis, with the expansion of the “shadow banking system”. Thus tight regulation could ultimately prove self-defeating. The warning is well taken. But there are answers. An interventionist one is full oversight of the evolving financial system, adding capital and other requirements as risk migrates. Another is to make sure that core financial institutions can survive an earthquake at the periphery. Yet another is greatly increased transparency requirements, thereby preventing such obvious absurdities as the build-up of huge off-balance sheet positions in vital institutions. Where does this leave us? We have to try far harder to reduce the crisis-prone nature of our financial system. We have to be able to intervene in a crisis without the comprehensive rescues needed last time. As Mr Geithner warns, these efforts might fail. Yet I can see no alternatives. LONDON – The European Parliament election has set off a painful process of rethinking not only how the European Union works, but also what it is fundamentally about. The outcome made it clear that there are now two Europes: one in which the logic of integration is deeply embedded in the political system and the social order; and one that rejects the basic assumptions of pooled sovereignty. The good news is that most of Europe is in the former category; the bad news is that the exceptions include two very large and powerful countries. The debate about Europe is not simply a discussion of the merits of this or that institutional or technical solution to a problem of political coordination; it is about how societies can organize themselves successfully in a globalized world. Up to now, there has been too much emphasis on institutional design, and not enough on social dynamism and innovation. Before the election, pro-Europeans regarded the upcoming vote as evidence that a new pattern of EU-wide democracy was emerging. Europe would look more like a country, with pan-European political parties proposing a top candidate (Spitzenkandidat as the Germans put it) to be the European Commission’s next president. But Euroskeptics countered that the new political order would not work. Voters would treat the elections as they had in the past: an opportunity to protest – though not against Europe so much as against their own national governments. They would also vote against austerity, imposed as a part of the EU’s strategy to defend the monetary union. Neither the optimists nor the pessimists were correct. No obvious European leader emerged from the election, and political haggling among EU governments over the next Commission president is likely to be prolonged and to look anything but democratic. At the same time, despite news headlines suggesting the contrary, there was no uniform wave of anti-Europeanism, or of disillusion with the European project. Indeed, in many countries, including some of those most severely hit by the financial and economic crisis, voters turned out to endorse both their governments and the European project. The pro-incumbent effect was discernible in Spain and, most dramatically, Italy, where the new reform government of Matteo Renzi defeated expectations that Italians would deliver another big protest vote. In Eastern Europe, Poland’s governing Civic Platform outperformed the nationalist opposition, while voters in the Baltic states, where the economic effects of austerity were the most severe in the entire EU, endorsed centrist European Parliament candidates. The unexpected weakness of the populist right in the Netherlands and the solid performance of the ruling Christian Democrats in Germany was a reflection of the same phenomenon: a new core Europe that is politically stable and self-confident. Across the Rhine and across the English Channel, however, things look very different. In both France and the United Kingdom, the success of insurgent populist parties has shaken the political landscape. In both countries, the incumbent party – the French Socialists and the British Conservatives – were not only beaten, but finished third. French Prime Minister Manuel Valls described the victory of Marine Le Pen’s far-right National Front as a political “earthquake.” And, though the Front’s triumph could easily be ascribed to the unpopularity of Socialist President François Hollande and his government, the parallel triumph of the UK Independence Party cannot be explained as a protest vote against the coalition government, which is delivering an economic recovery. The UKIP’s stunning victory was unambiguously a popular rejection of Europe, in particular of immigration from the EU. The election outcomes in France and Britain reflect both countries’ deeper deviations from the European pattern. For starters, their imperial legacies constrain them to behave like nineteenth-century Great Powers, not as part of the globalized and inter-connected world of the twenty-first century. This is reflected in their economic models. In Britain, over-dependence on financial services reflects the view that finance is the central coordinating activity of economic life, which made more sense in the nineteenth century than it does today. For France, the equivalent weakness is a proclivity for corporate gigantism. There are highly successful large industrial enterprises, most of them politically well connected, and tiny mom-and-pop businesses that are vestiges of a lost country. But the panoply of small and medium-size enterprises that make Germany and Spain entrepreneurial and economically successful is almost entirely missing in France. Both Britain and France are having vigorous debates about how to change their economic models. Some reformers in government want more German-style apprenticeship schemes; there is talk of tax breaks for small businesses, and of easing excessively intrusive regulatory burdens. It is difficult to see how either Britain or France can survive on the basis of nostalgia. Reforming both countries is as essential a task as reforming Europe’s creaky and complex political order. And that requires much more than just tweaking public spending and introducing some high-tech infrastructure projects; it means recreating the basis for a more dynamic society. Domestic reform in Europe’s two large former imperial powers is also an essential element in making Europe work. While it is conceivable that the European project could survive without Britain, a united Europe without France is unthinkable. Harold James is Professor of History and International Affairs at Princeton University, Professor of History at the European University Institute, Florence, and a senior fellow at the Center for International Governance Innovation. A specialist on German economic history and on globalization, he is the author of The Creation and Destruction of Value: The Globalization Cycle, Krupp: A History of the Legendary German Firm, and Making the European Monetary Union. SINGAPORE — China needs to change its approach to regional disputes, especially as territorial confrontations are only likely to become more frequent in hotly contested Asia Pacific, a senior U.S. military commander warned. While agreeing that Asia needs Chinese leadership, Adm. Samuel Locklear, the commander of the U.S. Pacific Command, told The Wall Street Journal that Chinese leaders "will have to make a decision on how they will help the region, and help lead the region through these issues," rather than posing challenges to regional stability. "The path they're on dealing with [territorial disputes] now is not productive for the region," said Adm. Locklear, speaking on the sidelines of the Shangri-La Dialogue, a regional security summit in Singapore, on Saturday. China needs to become a "net provider of security, not a net user of security," he continued, and help set the region "down a path of compromise" underpinned by "a fair legal framework." Earlier Saturday, U.S. Defense Secretary Chuck Hagel accused China of "destabilizing, unilateral actions" in the South China Sea, and of undermining the rule of law. China has come under increasing criticism from countries across Asia since deploying an oil-drilling platform in waters claimed by Hanoi in recent weeks and taking other steps to assert its territorial claims. China says its actions are normal activities in areas it considers its own territory. Chinese President Xi Jinping said Friday, "We will never stir up trouble, but will react in the necessary way to the provocations of countries involved." Speaking with Malaysian Prime Minister Najib Razak, according to the government-run Xinhua news agency, Mr. Xi said the South China Sea is "stable in general but signs deserving our attention have also emerged," though he said China opposes internationalizing regional issues. 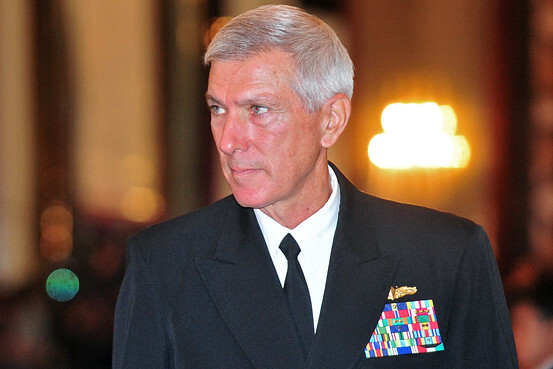 Adm. Locklear insisted that the U.S. is endeavoring to encourage China to assume responsible leadership of the region through the Obama administration's "pivot" policy of sending more military, diplomatic and economic assets to Asia, and that it is in no way seeking to contain China. "Our strategy is to bring China in as a valuable partner," he said. "I get asked all the time, Are we trying to contain China? I'm convinced that the only way we can contain China is if they choose to be contained, by their actions." Chinese military officials attending the Shangri-La Dialogue have said they don't buy American assurances that the U.S. harbors only good intentions toward China. Following his speech, Mr. Hagel faced a combative response from Maj. Gen. Yao Yunzhu, who questioned whether the U.S. is really neutral—as it claims—on the region's territorial disputes. Another Chinese major general, Zhu Chenghu, added that the "Chinese are not so stupid" as to believe that the U.S. is neutral, or that it is being genuine when it says it wants to work with China as an equal partner. The U.S. treats China as an enemy, not as a partner, Gen. Zhu said. Despite vocal Chinese concerns about U.S. activities in the region, Adm. Locklear expressed confidence that among Asian countries there is "a growing consensus" that disputes must be resolved through peaceful dialogue. He insisted that the U.S. retain the capability to deal with the threat posed by North Korea and other regional challenges. But at the same time Adm. Locklear said it would be a mistake to interpret the U.S. pivot strategy as meaning that the U.S. would "become the policeman for the region on every issue." The U.S. would remain central to Asia's security framework, he said, but in an age of "collective networks" wouldn't seek to do everything itself. That has already meant deepening alliances with Japan, the Philippines and South Korea, and it would also mean encouraging China to adopt a more rules-based approach, he explained. If China does that, "there is an opportunity for them to lead others in the region." —James Areddy in Shanghai contributed to this article.